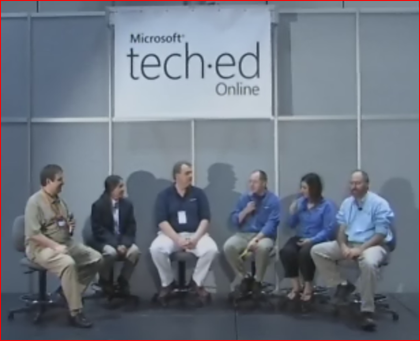 Microsoft hosted a panel discussion at TechEd 2008 in Orlando. The panel was moderated by George Cerbone with Mike Manos, Lewis Curtis, Beth Humphreys from Microsoft. Additional panel members are Kathy Malone and David Platt. The video is here. Don’t hesitate to just hit play, and listen to the audio while you are surfing the web. It has some good perspectives. Lewis Curtis presented first his past experiences over the last year working on Green IT at Microsoft. Mike Manos presented why going Green is a business responsibility to save energy and has monetary savings. Beth Humphreys shares her experiences in customer engagements discussing Green IT. Kathy Malone talks about her efforts to build compliance systems and a green IT developer community. David Platt, a recognized .NET developer expert, explains why developers are not creating green applications. His view is green should be an OS function, and developers don’t have enough time for this. Mike Manos brings up a good rebuttal that once Microsoft changed to an energy based chargeback system, the business units started to understand the impact of their SW on their energy bill, and have chosen energy efficiency vs. a focus on only performance. David Platt continues to make the point developer costs and power is negligible, repeating his point that the energy efficiency is the responsibility of the OS, and none of the effort should be taken on by the developer. The good thing is the rest of the panel think David Platt is wrong. Kathy Malone makes excellent points on compliance systems. This video gives you an idea of some of the people in Microsoft who are driving the Green Data Center efforts to the software developer community. I am glad I caught Lewis’s post.